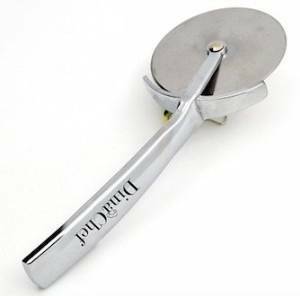 Thumbs Up or Down: DinaChef Amazing Pizza Cutter! Thumbs UP! DinaChef Amazing Pizza Cutter! Thumbs UP! This pizza cutter is so sharp it can get through the hardest crust like butter! I love the handle. Your hand fits perfect around it and it's super comfortable grip to cut. The quality is GREAT and the way it slices actually makes it fun to cut the pizza. This pizza cutter reminds me of a high end one, but at a fraction of the cost. Would make a great gift too. Free Color Changing Disney Shirt Has Started!